The FAMILY Act was reintroduced in the 116th Congress by Kirsten Gillibrand in the Senate and Rosa DeLauro in the House. It would provide workers with income when they need to take time off for their own health including recovery from childbirth, to care for a seriously ill family member or spouse, or to bond with a new baby or an adopted or foster child. One of the arguments against paid family and medical leave that opponents frequently use to try to discredit this popular social insurance program is that workers can’t afford it. The payroll deduction, technically a tax, is actually an insurance premium that finances these paid leaves. The money deducted from a worker’s paycheck goes into an insurance fund that can only be used for one purpose: to replace two-thirds of workers’ lost wages, up to a capped amount, for up to 12 weeks when they need to take a leave. Lower- and middle-wage workers would fall under the cap. The FAMILY Act covers workers in all companies regardless of the number of employees or whether the worker is employed full-time or part-time. It covers temporary workers as well as the self-employed. The cost of the program is modest and can be funded by small employee and employer payroll contributions, with each contributing two-tenths of one percent of monthly pay. Total cost is just 0.4 percent (0.004) of payroll. 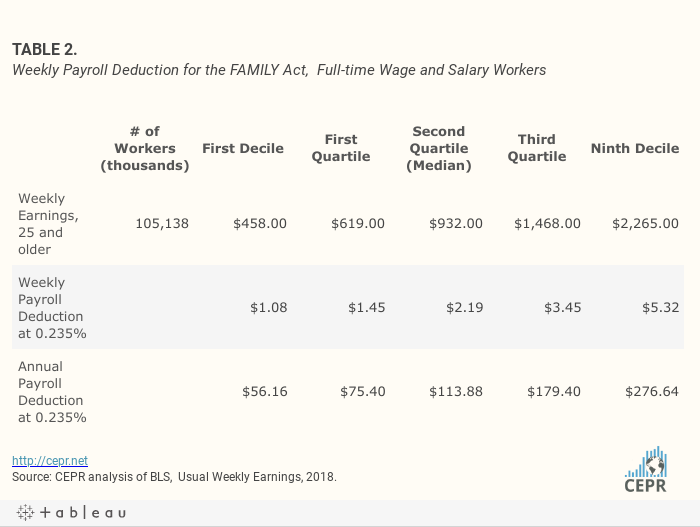 To provide a context for understanding whether a payroll deduction of 0.2 percent of payroll places a large burden on workers, especially those earning low wages, we compare the required payroll deduction for paid family and medical leave for households in each quintile of the earnings distribution with what households in that quintile pay for auto insurance. We use data from the 2017 Consumer Expenditure Survey to make this comparison. An advantage of this data source is that it includes payroll earnings of all members of the household, so it captures the situation of households with multiple earners. 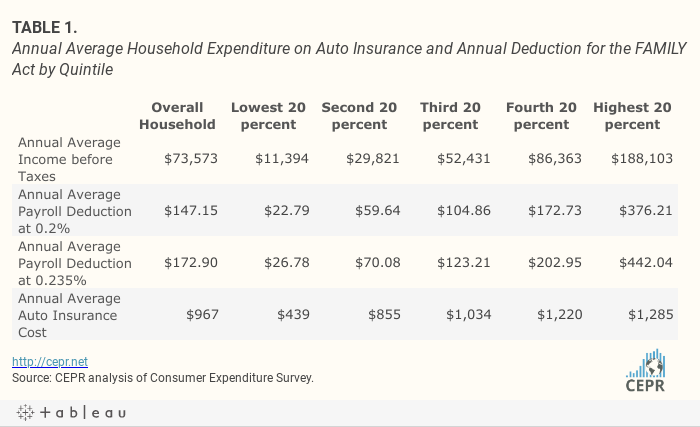 It provides both average income and average auto insurance premiums for households in each quintile, making it possible to compare the payroll deduction or premium for paid family and medical leave with the premium for auto insurance at various income levels. We can see this most clearly in Figure 1. However, the bottom quintile of household earnings includes many retiree households as well as households with disabled workers or workers who are unemployed. Households in higher income quintiles may have income from owning stocks, bonds or real estate. Average payroll earnings are likely to be lower than average income for households in each quintile. Applying the payroll tax to average income overstates the actual payroll deduction. To address this issue, we use data from the 2018 Annual Usual Weekly Earnings of Wage and Salary Workers. It provides payroll earnings for workers 25 years of age and older at various points on the wage distribution. This data allows us to calculate the payroll deduction for individual workers at different points in the wage distribution. We report the payroll deduction assuming that it is applied only on wages that are covered by social security. In this case, as we observed earlier, the payroll deduction is 0.235 percent (0.00235) of wages. A low-wage worker at the 10th percentile, earning $458 a week, would see a payroll deduction of just $1.08 a week to provide insurance that replaces two-thirds of lost wages when the worker is out on a family or medical leave. The typical (or median worker), earning $932 a week, would see a payroll deduction of $2.19. 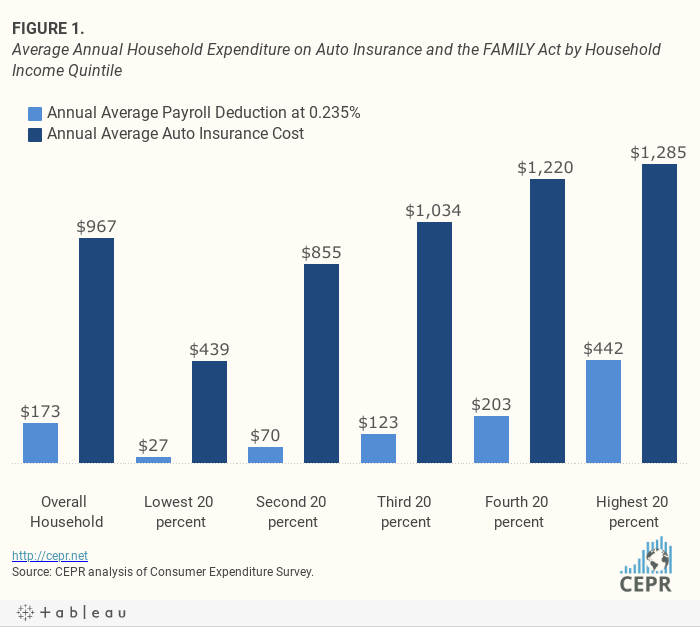 Compared with the cost of other forms of insurance – auto insurance, renters’ insurance or homeowners’ insurance, the cost to workers of up to 12 weeks of family or medical leave are quite modest. This assumes that the payroll deduction is applied to all wage income. If, instead, the deduction applies only to wages subject to the deduction for social security, then the total cost rises slightly to 0.47% of payroll, with the workers’ share equal to 0.235 percent of pay. We provide estimates of the cost to workers for both of these scenarios.